Edinburgh & London: William Blackwood and Sons,, 1861. The weaver of Raveloe. Octavo (198 x 131 mm). 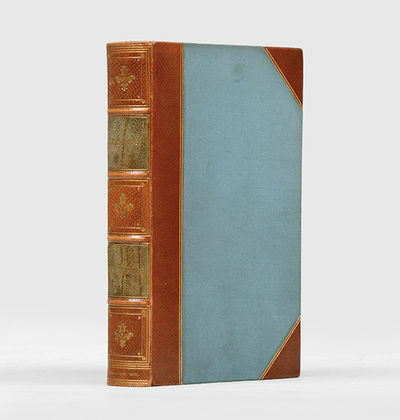 Early 20th-century tan half morocco by Birdsall & Son, Northampton, raised bands to spine, blue morocco labels, compartments decorated in gilt, blue cloth sides with a double gilt rule, marbled endpapers, top edge gilt. Bookplate of Sir George John Armytage, 6th Baronet (18421918) to front pastedown. Extremities a little rubbed, pale spotting to prelims. An excellent copy. First edition. "Though contemporary readers were, on the whole, fondest of Adam Bede among her novels, the response to Silas Marner was gratifyingly warm. Eight thousand copies were sold at the end of 1861, bringing her £1760" (ODNB).